Originally posted on Republic Report and featured on Grist, by David Halperin. Information from Greenpeace's ongoing research on Koch Industries Secretly Funding the Climate Denial Machine is cited in the infographic. This post also appears on Huffington Post and Republic Report. David Halperin, an attorney, was the founding director of Campus Progress at the Center for American Progress and a White House speechwriter for President Clinton. Click to read New Yorker’s article on David Koch’s influence over WNET. Image: The New Yorker. Amid concerns that Koch Industries could buy several major U.S. newspapers from Tribune Company, industrial billionaire David Koch was forced to step down as trustee of WNET, New York City's largest public TV station, after the New Yorker revealed how WNET gave Koch inappropriate influence over its programming. Mr. Koch was floating a seven-figure donation over WNET's leadership as the station aired a movie that portrayed him as a particularly greedy Manhattan resident. Sure enough, WNET didn't wind up receiving David Koch's hefty donation. Last Thursday, David Koch submitted his resignation at a WNET Board of Trustees meeting, and Brad Johnson at Forecast the Facts* reports that Koch's name was scrubbed from WNET's website several days prior to the resignation. Koch Industries' public relations website, KochFacts, released a preemptive response to the New Yorker article (which it has now urgently elaborated on), attempting to stifle New Yorker reporter Jane Mayer and the details of her newest piece. David Koch's resignation as a WNET Trustee, coupled with telling quotes from WNET president Neal Shapiro and other sources, makes it clear that Koch had too much influence at the decreasingly-public TV station in New York. The article is a fascinating culmination of two portions of the ongoing legacy of the Koch brothers: their desire to influence media, which is playing out with their company's bid for the Tribune Company's eight national daily newspapers, and their attempts to intimidate journalists and silence reporting they consider unfavorable. Jane Mayer's epic 2010 profile of the secretive billionaire brothers has left Charles and David Koch firmly positioned in the center stage of politics, and they have cursed her since. In repeated and increasingly desperate attempts to discredit Mayer and ease the impact of her reporting on Koch Industries' terrible reputation, the company posted her face on the Koch "Facts" website and wrote letters urging the American Society of Magazine Editors to stop considering Mayer's 2010 article for an award. The Koch brothers' attacks on Ms. Mayer provide more examples of how they use their connections to manipulate media (including in Mayer's new article, which caught Koch spokesperson Melissa Cohlmia in a complete lie). Update Oct. 2014: Daily Caller Foundation is now funded by Charles Koch Foundation, receiving $11,064 in 2012. Click to sign Greenpeace's 32,000-strong petition to Tribune Company: Don't Sell Your Newspapers to Koch Industries! Greenpeace remains concerned about how the Kochs have already used their media ties to promote denial of climate change science. Beyond the pressing issue of global warming, the implications of media manipulation from Koch Industries spans across issues from education to public employee unions to immigration to healthcare reform. This is why Greenpeace is working with a growing coalition of unions, media transparency advocates, environmentalists, good government watchdogs and other organizations to oppose Tribune Company's potential sale of its newspapers to Koch Industries, as well as Rupert Murdoch's News Corporation, and any other politically-charged business interest whose history indicates they would manipulate reporting at Tribune's papers for political and financial gain. *Disclosure: Forecast the Facts is one of the groups Greenpeace is working with to oppose Koch Industries' bid for Tribune Company. UPDATED May, 2015: after three years of continued attacks, Koch Industries, Koch's Americans for Prosperity, the Koch-backed Kansas Chamber of Commerce and the state's wind industry lobby cut a deal to weaken the Kansas RPS law by making compliance voluntary. This was a largely symbolic political victory for Koch's lobbyists, since the state's utilities have already exceeded the 2020 target for renewable energy generation targets established by the law. This followed many failed attempts by ALEC legislators to freeze or repeal RPS laws in North Carolina, Kansas, and many other states, ALEC legislators in Ohio froze its RPS law, effectively gutting the clean energy and energy efficiency incentives. Ohio state Senator and ALEC member Troy Balderson sponsored SB 310, which passed and was signed by early ALEC alumni Governor John Kasich. Troy Balderson, the third ALEC member senator in Ohio to introduce RPS attack legislation, is listed in ALEC's Energy, Environment and Agriculture task force rosters from 2011 (see ALEC EEA agendas from Cincinnati and New Orleans, from Common Cause's whisteblower complaint to the IRS about ALEC's lobbying activities). Balderson's ALEC affiliation was unfortunately unreported by Ohio press and bloggers. Despite a nationally-coordinated State Policy Network and fossil fuel industry attack on state RPS laws, Ohio is the only state that has allowed ALEC and SPN to undermine its own clean energy incentives, after quietly passing the RPS law with support from ALEC legislators back in 2008. 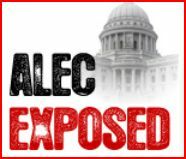 UPDATED July, 2013: The Topeka Capital-Journal confirmed that Rep. Dennis Hedke is a member of ALEC and will attend ALEC's Annual Meeting in Chicago from August 7-9, 2013. Text below has been updated to include Rep. Hedke's ALEC membership. Correction: this post listed Sen. Julia Lynn as a supporter of the RPS freeze--she is not and her name was removed from SB 82 co-sponsors below. A recent flood of Koch-supported think tanks, junk scientists and astroturf groups from inside and outside of Kansas are awaiting the outcome of a bill this week that could stall progress on the growth of clean energy in Kansas. States around the country, including Texas, Ohio, Missouri and North Carolina are poised to cut back on government support for clean energy jobs using model legislation from the American Legislative Exchange Council. ALEC, which brings companies together with state lawmakers to forge a wish list of corporate state laws behind closed doors, is coordinating this year's assault on state laws that require a gradual increase of electricity generated by clean energy sources. ALEC and a hoard of other Koch-funded interests operating under the umbrella of the State Policy Network have hit Kansas legislators hard with junk economic studies, junk science and a junk vision of more polluting energy in Kansas' future. Koch Industries lobbyist Jonathan Small has added direct pressure on Kansas lawmakers to rollback support for clean energy. This fossil fuel-funded attack ignores the good that wind energy has done for Kansas, a state known for its bipartisan support for its growing wind industry (see key report by Polsinelli Shughart). The state now has 19 operating wind farms that have brought millions to farmers leasing their land and millions more to the state, county and local levels (NRDC). The American Wind Energy Association says that Kansas wind industry jobs have grown to 13,000 with the help of incentives like the renewable portfolio standard. Unfortunately, clean energy is not palatable to the billionaire Koch brothers or the influence peddlers they finance. All of the following State Policy Network affiliates (except the Kansas Policy Institute) are directly funded by the Koch brothers, while most of the groups get secretive grants through the Koch-affiliated "Dark Money ATM," Donors Trust and Donors Capital Fund, which have distributed over $120,000,000 to 100 groups involved in climate denial since 2002. Based out of Suffolk University's economics department, the Beacon Hill Institute wrote the fundamentally flawed analysis that ALEC is using to scare legislators into thinking that renewable portfolio standards will destroy the economy. In reality, electricity prices do not correlate with state RPS laws (see also Kansas Corporation Commission). An extensive debunk of the Beacon Hill report was done by Synapse Energy Economics, and similar critiques can be read in the Portland Press Herald and the Maine Morning Sentinel, the Union of Concerned Scientists, the Nature Resources Defense Council and the Washington Post. The definitive Post article confirms that the Beacon Hill Institute is Koch-funded. This may be through $729,826 in recent grants (2008-2011) from the Charles G. Koch Foundation to Suffolk University. The Kochs tend to send grants to economics departments, causing controversy at Florida State University and other schools over professor hiring processes. Beacon Hill's Michael Head co-authored the reports that ALEC and the State Policy Network are using in several states. Mr. Head specializes in STAMP modeling, a form of economic analysis that has been criticized for its limitations and poor assumptions in the case of energy analysis. Michael Head testified before the Kansas legislature on February 14th to promote the flawed findings of his report. Mr. Head testified alongside members of the Heartland Institute, Americans for Prosperity and the Kansas Policy Institute (see more on each, below), all of which are members of ALEC and SPN. ALEC is leading the nationally-coordinated attack on state renewable portfolio standards as part of an ambitious dirty energy agenda for the members of its anti-environmental task force, like Koch Industries, ExxonMobil, Peabody Energy, Duke Energy and other major oil, gas and coal interests. ALEC's "Electricity Freedom Act" is a full repeal of state laws requiring increasing electricity generation from clean sources, although in some states the model has morphed into a freeze of those targets rather than a full repeal. Kansas is one of those states. Senators Forrest Knox, Ty Masterson and Mike Petersen. While it's unclear if the lead House sponsor Rep. Dennis Hedke is directly affiliated with ALEC, he spoke directly with a Koch Industries lobbyist about the bill and has a close relationship with the Heartland Institute, which promoted one of his books. Heartland is based in Chicago and perhaps best known for its billboard comparing those who recognize climate change with the Unabomber (for which they lost over $1.4 million in corporate sponsorship along with the "mutiny" of their entire Insurance department, now the R Street Institute). The Washington Post reports that ALEC's "Electricity Freedom Act" was created by the Heartland Institute. Heartland has long been a paying member of ALEC's Energy, Environment and Agriculture task force along with Koch, Exxon and others. Citing the flawed Beacon Hill reports, Heartland has encouraged a repeal of Kansas' clean energy incentives on its website. Heartland lawyer James Taylor testified before the Kansas legislature in February, opining that the growth of Kansas' clean energy sector is "punishing the state’s economy and environment." James Taylor was flown into Kansas City for an Americans for Prosperity Foundation event intended to undermine the Kansas RPS law. The AFP Foundation is chaired by David Koch. Americans for Prosperity was created by the Kochs with help from Koch Industries executive Richard Fink after the demise of their previous organization, Citizens for a Sound Economy (CSE), which split into AFP and FreedomWorks in 2004. "We believe that HB 2241 is a step in the right direction, but that it doesn't go far enough. Instead, AFP supports a full repeal of the renewable energy mandate in Kansas." Derrick Sontag apparently only cited a range of debunked studies (the "Spanish" study and the flawed Beacon Hill report) and information from Koch-funded interests like the Institute for Energy Research and "State Budget Solutions," a project of several State Policy Network groups including ALEC and the Mercatus Center, a think tank founded and heavily-funded by the Kochs. KPI Trustee George Pearson is a Koch family friend who "worked for nearly three decades for the Koch family as manager of various Koch Foundations and for Koch Industries." Pearson helped Charles Koch start the Cato Institute as one of Cato's original shareholders and worked for the Institute for Humane Studies at George Mason University, one of Charles Koch's most heavily-financed projects. The Kansas Policy Institute (KPI) has been the central coordinating think tank within Kansas as outside interests have backed ALEC's attack clean energy laws. KPI co-published the debunked Beacon Hill Institute report that ALEC has used for its clean energy standard repeal in Kansas (see sources in Beacon Hill section above for debunking). Kansas Policy Institute Vice President & Policy Director James Franko testified in the Kansas legislature alongside representatives of Heartland Institute, Americans for Prosperity and Beacon Hill Institute on Feb. 14 to weaken Kansas's renewable portfolio standard. We have no objection to the production of renewable energy. [...] Our objection is to government intervention that forces utility companies to purchase more expensive renewable energy and pass those costs on to consumers. James Franko's free market logic comes with the usual holes--no mention of the "costs" of coal and other polluting forms of energy that taint our air, water and bodies, nor any mention of how the government spends billions each year propping up the coal and oil industries. "Given the importance of this issue, we would like to invite you to join us for lunch on Thursday 14 February to hear from the author of a study we published last year exploring the costs and benefits of the Renewable Portfolio Standard (RPS). Not only will we be discussing KPI’s study but offering a review of different studies that have been presented to the Legislature." KPI has served as the glue for other State Policy Network affiliates entering Kansas to amplify the opposition to clean energy. Chris Horner is a senior fellow at CEI and the lead lawyer at ATI, a close CEI affiliate known for its litigious harassment of climate scientist Michael Mann alongside Virginia attorney General Ken Cuccinelli, who just worked with coal utility companies to kill Virginia's renewable energy law. ATI was behind a leaked memo encouraging "subversion" among local groups opposed to wind energy projects. Horner testified before the Kansas legislature on February 12 to encourage the false notion that the renewable energy portfolio standard is going to make consumer electricity bills skyrocket (again, there is no correlation between state RPS laws and electricity prices). He cited the long-debunked "Spanish" study, which Koch front groups have cited for years in attempts to undermine clean energy. Chris Horner is affiliated with several other Koch- and Exxon-funded State Policy Network affiliates such as the National Center for Policy Analysis and Tech Central Station (set up by DCI Group). 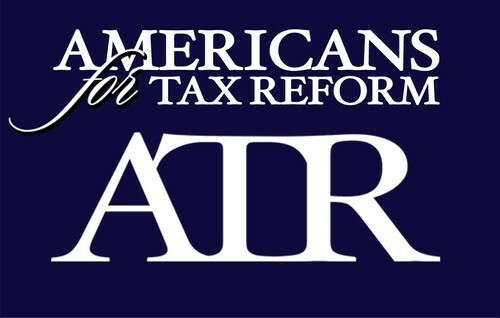 ATR president Grover Norquist wrote a Feb. 27, 2013 letter supporting the Rep. Dennis Hedke’s House bill shortly before the bill was kicked back into the House Utilities commission. This Kansas letter followed an ATR op-ed in Politico encouraging rollbacks of state clean energy incentives, claiming they are a "tax," which is Norquist's consistent tactic against anything the financiers of ATR don't feel like supporting. Disgraced scientists Willie Soon and John Christy were flown in by Americans for Prosperity to assure state legislators that global warming isn't a problem (it's already a $1.2 trillion problem annually). Doctor's Soon and Christy themselves directly funded by Koch or directly affiliated with several Koch-funded interests like the Competitive Enterprise Institute and Heartland. Dr. Soon's questionable climate research now receives funding through the Donors Trust network--$115,000 in 2011 and 2012. See Skeptical Science's profile of John Christy for a through explanation of why he is not a credible voice in the scientific community studying climate change, using peer-reviewed climate research as refutation. Donors Trust provided over 36% of SPN's 2010 budget and over 40% of SPN's 2011 budget (budgets for both years listed in their 2011 IRS filing). Operations in oil refining, oil and gas pipelines, fossil fuel commodity & derivatives trading, petrochemical manufacturing, fertilizers, textiles, wood and paper products, consumer tissue products, cattle ranching, and other ventures. 84% private owned between brothers Charles Koch and David Koch, each worth an estimated $34 billion (Forbes) to $44.7 billion (Bloomberg). Associated foundations fund State Policy Network, ALEC, Heartland Institute, Americans for Prosperity, Beacon Hill Institute, Competitive Enterprise Institute, Americans for Tax Reform and Dr. Willie Soon. 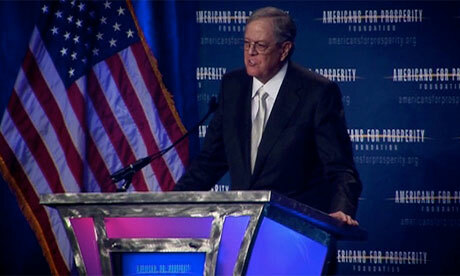 Koch brothers founded Americans for Prosperity and helped establish the Heartland Institute. The money trail of the out-of-state groups inundating Kansas with their sudden interest in killing the state's incentives for wind energy leads back to the Koch brothers. While Koch Industries has deployed its own lobbyists to compliment the effort, the brothers who lead the company have tapped into their broader national network to aid the fight against clean energy in Kansas. Charles and David Koch, the billionaire brothers who own Koch Industries, have spent over $67,000,000 from their family foundations on groups who have denied the existence or extent of global climate change, promote fossil fuel use and block policies that promote clean energy development. Article composed with one of the best online HTML tools. Please purchase a htmlg membership to stop adding links to the edited documents. The new film Greedy Lying Bastards (GLB for short) opens today in theaters in about 30 cities around the US. Go see it, first of all...there is a theater list here. And tell your friends about it. "Right...the only scientists who are capable of coming to a conclusion as barking mad as that are computer modelers. These are typically zitty teenagers, sitting in dark rooms with a can of CocaCola and too many donuts and playing on their X-Box 360s and they are making predictions about the climate..."
Wow. And that's only the beginning of the lunacy and nastiness from the deniers. The long legacy of denial and deception will never be erased for members of the Carbon Club - Big Oil, Dirty Coal, mining, metals, auto companies - all those who would rather the fossil fuel age went on forever. The auto companies have modified their position over the years. In the 90s, this whole team was lock step. Now there are laggards and leaders. Who are the laggards? The culprits who have held us back? They know who they are. We know exactly who they are. And we know exactly they have done...Greedy Lying Bastards is the most complete telling of this story to date. We have the files at ExxonSecrets.org and PolluterWatch, in fact file cabinets full - twenty plus years of research and documentation of industry efforts to slow down the uptake of climate science, replace urgency with uncertainty and derail the policy train that is pulled along by that scientific consensus. Steve Coll's book Private Empire, which came out in 2012, pulled even more details into focus about Exxon's roll in the climate denial machine. The legion ExxonMobil, the American Petroleum Institute, the Koch brothers, electric companies like Southern Company and others have collectively dumped millions of dollars into front groups and think tanks they could prompt to say and do things they couldn’t be caught dead saying or doing themselves. The corporate puppeteers knew that sowing doubt and uncertainty would buy them time. The free market front groupers had hit pay dirt and feel that taking action on climate change is some UN conspiracy to shackle their god given free market freedom. So what? What can be done to hold these individuals and corporations accountable for their actions? What court of law will find them guilty of obstruction and deception? The film shows the similarity to the tobacco industry, who fought on for years after knowing full well that cigarettes caused health problems and nicotine is addictive – straight up denial. There will be hearings, trials, cases, whistle blowers. The truth will be known. Join the petition to ask Congress to investigate the Climate Denial Machine. Bottom line is real people are craving answers as extreme floods and hurricane superstorms sweep away everything they own, as “exceptional” drought knocks farms off the map one by one, as heat waves make life unbearable. The weather is out of whack and people are waking up one by one and want to know who to blame for their misfortune. The culprits try to change their stripes, say they have been “misunderstood” in the case of Exxon, but you cannot change history. Their actions have contributed to two decades of inaction, costing us lives, property loss, economic and ecological damage. Species are going and will go extinct due to this inaction. This is no joke. The latest academic treatment linking the Arab Spring to climate change raises the stakes again. Climate security is national security. Inseparable. Climate change is about where we live and how we live there. About how we grow our food, our water sources, the way we build our homes and buildings…All these things are adapted to the climate of the place where we are. All this is now turning upside down. When 100 year events happen every year, when thousands of weather records are broken in a single year, it is inescapable. And if there is one thing that gets people all riled up, its being lied to. Good luck explaining yourself to our children and grandchildren, David and Charles Koch, Rex Tillerson and Lee Raymond at Exxon before him... and all the others in your denial army. You better start now. Hurricane Sandy as seen from Space. From The Guardian. This guest article was written by Mary Bottari and Sara Jerving of the Center for Media and Democracy, crossposted from PR Watch. The fossil fuel industry has paid a hefty price for the privilege of framing the political discourse about America's energy future. Hundreds of millions have flowed into campaign coffers from energy companies attempting to purchase complete freedom to drill, frack, and burn. 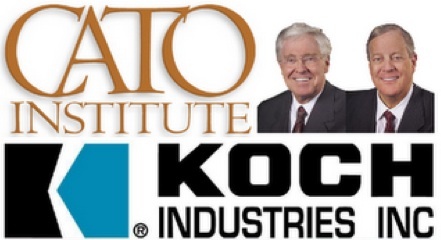 Huge "dark money" groups, the Koch's, Karl Rove, the U.S. Chamber of Commerce, join dozens of oil and gas industry associations in pouring money into television ad campaigns demanding "energy independence," while trashing wind and solar. Things were going great. Even though hurricanes had slammed into two Republican National Conventions in a row, no one seemed to notice, and Romney's only mention of climate changes was as a punchline. 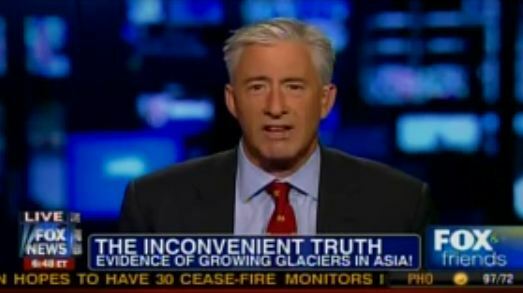 No reporter asked a single climate change question of Romney or Obama during the debates. Even though the U.S. now had 175,000 wind and solar jobs, pro-green energy forces were disappointed in Obama and were less active. For big oil and gas the White House and the Senate were within reach. Critically, they had to move fast before the majority of voters started to not only notice the changing climate patterns, but really started to worry about them. Then something happened that completely scrambled the board. Hurricane Sandy blew New Jersey out of the water and inundated New York. The massive storm threw the Romney campaign completely off-message. Not only did they have nothing to say about the serious issue of climate change and the potential for more frequent and more devastating monster storms, the Romney-Ryan message of "smaller government" and "fewer first responders" sank in the Brooklyn Battery Tunnel. In an unprecedented, last-minute move, Independent Mayor Michael Bloomberg threw his support behind Obama yesterday. His statement "A Vote for a President to Lead on Climate Change" lays out the seriousness of the situation. "In just 14 months, two hurricanes have forced us to evacuate neighborhoods -- something our city government had never done before. If this is a trend, it is simply not sustainable," Bloomberg states. Until Sandy rolled in, the airwaves were completely dominated by the fossil fuel industry. According to The New York Times, by mid-September there had already been a $153 million spent on TV ads that promoted the fossil fuel industry. The analysis showed that energy topics were mentioned more frequently than any other issue besides jobs and the economy. This figure is four times what clean energy advocates were spending. The numbers stand in sharp contrast to the last presidential election in which the green energy industry and other forces spent $152 million compared to $109 million spent on fossil fuel interests. Broadly, the ads promote fossil fuels in the context of jobs, domestic security, and energy prices. Combined, they try to convince Americans that "energy independence" should be the nation's top priority. Yet they neglect to point out that solar and wind also create high-wage jobs and energy independence too. According to Open Secrets, oil and gas campaign contributions are at historic highs and are more lopsided than ever before with 90 percent of the funds going to Republican candidates. Top contributors include William Koch's Oxbow Corp, Chevron, Exxon Mobil, and Koch Industries, who have already contributed $59 million to federal candidates. Leading coal mining corporations, such as Alliance Resource Partners, Cumberland Development, and Murray Energy, have kicked in $11.6 million to federal candidates. But the money does not stop there. The Citizens United Supreme Court decision has opened the door to unprecedented spending by "dark money" nonprofits, SuperPACs and new constellations of trade associations that are on track to spend over $1 billion to "educate" voters about the issues, including the urgent need to extract and burn every last bit of fossil fuel. Karl Rove's Crossroads GPS, a "dark money" group and his American Crossroads SuperPAC, pledged to spend $300 million in this election, a large percentage on fossil fuel spin. There are dozens of ads in the presidential race and in Congressional races. One Crossroads ad blames Obama for higher gas prices. Another slams Obama for putting the Keystone Pipeline on hold. While Crossroads GPS does not disclose its donors, American Crossroads PAC does and it is loaded with fossil fuel contributors, including Alliance Resources Partners CEO Joe Craft who has given the group $1.25 million, Petco Petroleum which has given the group $1 million, and over $2 million from TRT holdings, which controls Tana Exploration, a Texas-based oil and gas company. David Koch's Americans for Prosperity "dark money" group, pledged to spend over $100 million this year in support of Republican candidates. The group's ads also attack Obama and clean energy when talking about Solyndra and the stimulus bill which allegedly sent some clean energy jobs overseas. More recently they have pushed pro-coal "Stand with Coal" ads in Ohio and Virginia. The U.S. Chamber of Commerce, an industry association and dark money group, has pledged to spend more than $50 million on the election and has fielded energy ads in key races such as Ohio with a messages like "Shale Works for Us," in promotion of expanding drilling for shale oil and gas. The American Coalition for Clean Coal Electricity, a coal industry front group, has pledged to spend some $40 million on coal related ads. One ad, targeting Ohio's Sherrod Brown, criticizes the Senator for endorsing "higher energy taxes" linking him to "Washington's costly energy policies." The American Petroleum Institute, an industry trade association, has pledged some $40 million this campaign season on efforts to push the expansion of oil and gas drilling. Two of their primary campaigns, "Vote 4 Energy" and "Energy Citizens" attempt to exert the aura of a grassroots base pushing for fossil fuel development. Their ads feature "energy voters" parroting fossil fuel talking points. The American Energy Alliance, a "dark money" group run by former Koch Industries lobbyist Tom Pyle, is spending millions alleging that Obama's policies would lead to $9 a gallon of gas and a recent ad airing in Ohio and Virginia harps on Obama for comments he made about coal industry in 2008. Rarely are voters seeing any counter-narrative. Alternative energy forces have spent only $2 million, and some environmental groups are weighing in with modest resources. New ads by the League of Conservation Voters saying U.S. Senate Candidate Tammy Baldwin (D-WI) will stop the offshoring of U.S. jobs and "will end big oil subsidies" -- with cheerful Wisconsin windmills and pumpkins in the background -- started only in the final days of the campaign. Is it any wonder that candidates have been able to ignore the serious issues? "To ignore a global crisis that has been fully understood for over 15 years and is quickly slipping out of control shows just how far coal and oil money have drowned out constituents all the way from the Statehouse to the White House," said Greenpeace's Connor Gibson. What Does the Fossil Fuel Industry Want? Although environmentalists are not happy with what they perceive as Obama's timidity, the fossil fuel industry is apoplectic about the steps he did take as president. They have leveled blistering criticism about Obama's efforts to slow down the Keystone Pipeline; they don't like his new auto emissions standards; they are unhappy with new EPA mercury emissions rules for boilers; and they don't like the fact that permits for drilling and fracking on federal lands have slowed. The industry is looking for a victory in the battle over TransCanada's Keystone XL pipeline project, which would carry heavy tar-sands crude oil from Canada to Gulf Coast refineries, exporting some portion of the oil overseas. Construction of the pipeline was confronted by an active movement of citizens concerned about the impact that the pipeline would have on communities and on the threat burning the tar sands posed to the planet. Burning all the available tar sands would be "game over" for the climate, according to NASA scientist Jim Hansen, one of the nation's most respected climate change experts. Romney has vowed to give the project clearance on his first day in office, while Obama has approved a portion of the segment, and has allowed for further environmental impact study of the northern portion. The industry also wants carte blanche to use federal lands for the highly controversial practice of hydraulic fracturing or "fracking" for shale oil and gas. Fracking has the documented potential to contaminate drinking water sources and foul both air and land -- in addition to spoiling millions of gallons of fresh water as part of the drilling process. The industry is calling for a streamline on the permitting process for fossil fuel development on all lands. While industry's ads have argued that increased drilling will decrease gas prices, global gas prices largely follow international trends. The industry is also keen to hold onto to the billions of fossil fuel subsidies it receives each year from the federal government. According to the International Energy Agency, fossil fuel subsidies from the government are 12 times greater than renewable energy. No matter who wins the presidency, there will be major battles on each of these issues. The question is, after years of fossil fuel propaganda, how engaged will the American public be in the effort to save the planet from the fossil fuel industry? According to author and activist Bill McKibben, "This will be the warmest year in American history. It came with the warmest month in American history, July. It featured a statistically almost-impossible summer-in-March heat wave. It brought us a drought so deep that food prices have gone up 40 percent around the world. It brought us this completely unprecedented mega-storm, the biggest storm, as one weatherman put it yesterday, to hit New York since its founding in 1624," McKibben told Time. The problem according to McKibben is that "there's been a 20-year bipartisan effort in Washington to accomplish nothing, and it reached its comedic height this summer when our presidential candidates, despite barnstorming through the warmest summer in American history, seemed not to notice. The reason is the incredible power of the fossil fuel industry. Until we can diminish that power, I imagine nothing very large will be done to deal with climate." Hurricane Sandy has launched a full frontal attack on fossil fuel industry propaganda. It is up to us to follow in her path. Will Dooling contributed to this article.